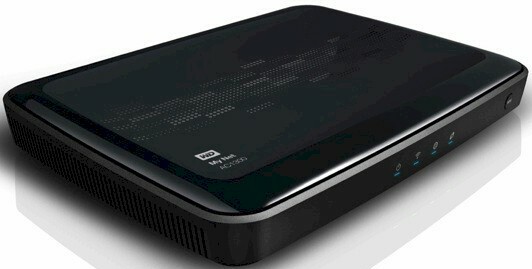 It has taken me waaaay too long to review WD's draft 802.11ac router that it sent me lo, so many months ago. Unfortunately, it arrived at the point where I was switching over to the new wireless test process, which I wanted to test it with. So, my thanks to WD for being patient while I worked out the kinks in the new process. The My Net AC1300 establishes the top of WD's My Net "HD" router line as shown in the comparison chart from WD's website below. We reviewed the N900 last July and the AC1300's routing features are essentially the same. The main difference between the two is on the wireless side with the AC1300 being a 3x3 802.11a/b/g/n/ac router vs. the N900's 3x3 802.11a/b/g/n radios. The AC1300's 2.4 GHz radio supports a 450 Mbps maximum link rate and its 5 GHz radio tops out at 1300 Mbps. Despite WD's moniker, our wireless router classification system slots the AC1300 as an AC1750 class product. Fans of the N900's unique built-in seven port Gigabit switch will be sad to see only the usual four-port switch in the AC1300. But at least it remains Gigabit. Potential buyers may also have mixed feelings about the USB ports. The AC1300 still provides two, but they are still USB 2.0 vs. the faster USB 3.0 ports starting to appear in the new crop of draft 11ac routers based on Broadcom's newer router SoC. Storage sharing functions still include SMB, FTP, DLNA, iTunes and "cloud" access via WD 2go. Printer sharing also still requires installation of WD Print Share software. But now there are versions for both Windows and Mac OS. Like all other first-generation draft 802.11ac routers, the AC1300 sports essentially the same all-Broadcom design. The FCC ID says the design comes from CyberTAN Technology, a seasoned Taiwanese OEM/ODM. Since the FCC ID photos are so fuzzy, I popped the top of my review sample after testing and took off two of the RF shields to confirm the processor and switch used. The key components are summarized in the table below. I was surprised to see so little flash memory compared to other draft 11ac routers, which usually have 128 MB. The mini PCI-e format of the 5 GHz radio belies the AC1300's design age. Later designs have the 5 GHz radio integrated onto the main board, as is the 2.4 GHz radio already. I didn't take the top off the RF sections of the two radios. The FCC photos are clear enough to show three devices within each radio's RF shield. I assume they are external power amplifiers, similar to those found in other first-gen Broadcom draft 11ac router designs. The photo's aren't clear enough to ID the specific manufacturers, however.